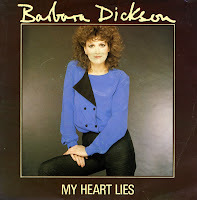 The single 'My heart lies' didn't chart in the UK, but in the Netherlands it became her biggest hit in early 1982. It peaked at number 27 in the Dutch Top 40, which isn't spectacular, but it's two places higher than Barbara Dickson's 1981 hit, 'January February'. Alan Tarney produced this single, as well as the album 'You know it's me' (1982). The title track of that album appears on the B-side of this single. I liked this single so much I bought it twice: once in 1999 and three years later I did it again. It was an honest mistake. Luckily it was a cheap single on both occasions.